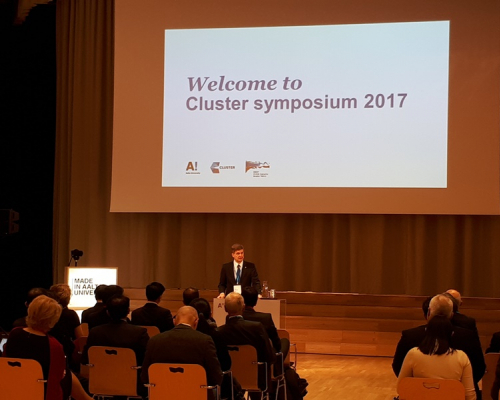 The delegation of Tomsk Polytechnic University takes part in the symposium organized by the Consortium Linking Universities of Science and Technology for Education and Research (CLUSTER), which is taking place this week at the University of Aalto, Finland. The symposium is dedicated to the Introduction of Entrepreneurship in Engineering Education. TPU has presented the rehabilitation technologies developed by the university students, which ally engineers, entrepreneurs and people with special needs. CLUSTER comprises 12 leading European engineering universities, as well as university associate members from around the world. Over 3,000 professors, 11,000 faculty members, 14,000 PhD students and 140,000 students are under the auspices of CLUSTER. CLUSTER is aimed at expanding cooperation between students, faculty and administration of the universities, including assistance in the elaboration of joint educational programs and the implementation of joint research projects. Tomsk Polytechnic University is the only Russian associate member of CLUSTER. Currently, the University cooperates with 9 out of 12 university members of the consortium. At the annual symposium devoted this year to the integration of entrepreneurship into engineering education the representatives of Tomsk Polytechnic University Deputy Director of the School of Engineering Entrepreneurship Stepan Khachin and Head of the Office of International Programs Svetlana Rybushkina discussed the possibilities of academic and research cooperation with European and Asian colleagues and told how TPU integrates engineering entrepreneurship into educational process. TPU representatives took part in the meeting of the presidents and vice-presidents of CLUSTER partner universities, as well as in a workshop devoted to the development of the Sino-European platform of engineering education. In addition, TPU delegates told about the development of student entrepreneurial environment and the TPU student developments for rehabilitation of disabled people. One of the successful examples is the TPU win in the Preactum competition. TPU students won 1 million rubles to launch their projects devoted to life quality improvement of disabled people. TPU social projects include the Mobile Signer for deaf and hard of hearing people; the Universal Doorphone for low-mobile people; Smart Running Shoes which can monitor daily activity, correct gait and load on the feet; the Pill Band which alerts patients on medication intake; Blind Glasses through which visually impaired people can see the world due to ultrasonic signals and a number of other projects aimed at improving life quality of disabled people.